Myth #1 – It takes a all day to do the cooking. The great thing about it is its flexibility. Don’t have a all day, do a fewer hour cooking session. Or triple up on your dinners for a few weeks and build up some reserves. Cook 10 of the same recipe and find 9 friends who will do the same, but a different recipe. Then swap ‘em. There are lots of ways to freezer cook! And after you try it for awhile, you will realize that the time you save in meal prep and clean up each evening is well worth the time it takes to shop and cook for large quantities. Myth #2 – Only experienced cooks can do this. Absolutely NOT! Only the most basic cooking knowledge is needed to cook most of freezer recipes. Most freezer recipes give very detailed instructions so that even the least experienced cook can be successful. Myth #3 – Owning a stand alone freezer is a must. About 30 gallon freezer bags will fit into a standard refrigerator’s freezer. But it does help to have some extra space. Upright freezers are easy to organize and take up less floor space. They also are an inexpensive option and hold a lot more food than you think! Myth #4 – Freezer containers and pans will cost a fortune. I use freezer bags most of the time because it is the most economical way. The foods in them can be thawed and put into your favorite dish for baking. Myth #5 – Freezer foods don’t taste fresh. Most freezer recipes are made “from scratch” and are designed so that you assemble your foods and freeze them to cook after thawing. I promise the aromas and flavors of fresh cooking will remain. For those busy days, you can choose to prebake some of your entrées and side dishes so that you only have a short warm up time. Myth #6 – Most of the foods I love to eat probably can’t be frozen. Actually, most foods freeze well! Try it and you will be surprised by how delicious your food will taste. Myth #7 – Having meals in the freezer means that you can’t eat out. Don’t believe it, but you probably won’t want to. Because you will be looking forward to eating your home cooking. Myth #8 – My family will get tired of eating the same food over and over again. The easiest way to avoid that is to meal plan for the month. In your meal plan, include some fresh meals that you generally make fresh such as breakfast for dinner, soup and sandwich night, taco night, etc. 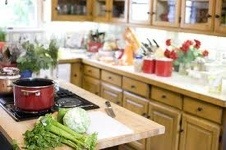 Make freezer cooking fun for your family by letting them help you pick out the recipes to include in your cooking day. This will make the recipe rotation more enjoyable for you and your family! Myth #9 – My family won’t eat casseroles. Freezer cooking doesn’t mean casseroles for every meal! There are so many different foods that freeze great. Try dump marinades, soup, sandwich, and breakfast recipes for starters!